A statue of Vladimir Lenin in Odessa, Ukraine, has been refashioned into Darth Vader. A Ukrainian artist, Alexander Milov, whose work appeared at Burning Man this year, transformed the statue in response to recent decommunization laws, which require the removal of Communist symbols in Ukraine. Lenin’s face has been covered by Darth Vader’s mask, and his coat has been turned into a cape. The helmet also reportedly serves as a Wi-Fi hot spot. “I wanted to make a symbol of American pop culture which appears to be more durable than the Soviet ideal,” Mr. Milov told the BBC. The decommunization law was passed in April by the Ukrainian Parliament following Russian military aggression into the country. Sicario: a reverse western. normally for a western, the vacuum of government requires individual heroic violence to establish law, order and markets. but here governments and markets lead to so much chaos that the law needs to bring back individual violence to reestablish a market order outside the law. The Martian: the Lockean illusion of robinsoe crusoe as the original capitalist becomes reality in this allegory of a scientific super-hero who uses technology, humor and interstellar communication to fight non-natural nature on mars while humans on earth develop a new universal social contract. Spectre: Conspiracy theory as rational choice for modern Englishman’s lack of importance in global capitalism. Creed: Rocky retold as a black lives matter biopic. Black Mass: How the Irish became white. Steve Jobs: A paean to our last god, a frail mortal who touched the heavens by conquering the social form of mediation. Suffragete: Class war as gender war as moral war as political war. 99 Homes: Foreclosure crisis as proletarian horror story; abstract law of value takes human form. Property owns people, work is suicide. Hunger Games: Mockingjay – Part 2: Revolution against capital, against patriarchy, against the state, against itself reveals the negativity of communisation in our present moment. The Walk: Metaphor of individual bravery, daring, and ingenuity hidden within another metaphor for French stupidity and American spectacle. Trumbo: Communism as retro chic. Bridge of Spies: Berlin as morally ambiguous city between decaying empires. Still true today. The Intern: Feminism leans against a glass wall which only a male baby boomer can break. Pessimism is the night-side of thought, a melodrama of the futility of the brain, a poetry written in the graveyard of philosophy. Pessimism is a lyrical failure of philosophical thinking, each attempt at clear and coherent thought, sullen and submerged in the hidden joy of its own futility. The closest pessimism comes to philosophical argument is the droll and laconic “We’ll never make it,” or simply: “We’re doomed.” Every effort doomed to failure, every project doomed to incompletion, every life doomed to be unlived, every thought doomed to be unthought. Pessimism is the lowest form of philosophy, frequently disparaged and dismissed, merely the symptom of a bad attitude. No one ever needs pessimism, in the way that one needs optimism to inspire one to great heights and to pick oneself up, in the way one needs constructive criticism, advice and feedback, inspirational books or a pat on the back. No one needs pessimism, though I like to imagine the idea of a pessimist activism. No one needs pessimism, and yet everyone—without exception—has, at some point in their lives, had to confront pessimism, if not as a philosophy then as a grievance—against one’s self or others, against one’s surroundings or one’s life, against the state of things or the world in general. There is little redemption for pessimism, and no consolation prize. Ultimately, pessimism is weary of everything and of itself. Pessimism is the philosophical form of disenchantment—disenchantment as chanting, a chant, a mantra, a solitary, monophonic voice rendered insignificant by the intimate immensity surrounding it. In pessimism, the first axiom is a long, low, funereal sigh. The assassins, or sicarios, as they’re called in Mexico, were members of La Familia Michoacana, a cartel that, despite its penchant for decapitation and torture, had pretensions to piety and a certain rough chivalry. (Years later, remnants of La Familia reorganized as a group calling itself the Knights Templar.) The syndicate’s temporal and spiritual head, Nazario Moreno González, wrote a “bible” of inspirational sayings and admonitions, which members of La Familia were expected to carry with them. Also required reading in the cartel was the book from which Moreno González cribbed much of his pop philosophy, “Wild at Heart: Discovering the Secret of a Man’s Soul,” a paean to muscular Christianity by John Eldredge, an American evangelical who lives in Colorado Springs. Kamil Ahsan spoke with Moore about his book Capitalism in the Web of Life (Verso), released last month, to grapple with his new challenges to old assumptions. Kamil Ahsan: What was the impetus for Capitalism in the Web of Life? Jason W. Moore: I wanted to come up with a framework that would allow us to understand the history of the last five centuries in a way that was adequate to the crisis we face today. For the past four decades, we’ve had a “Green Arithmetic” approach to crisis. When we’ve had an economic or social crisis or any other kind of crisis, they all go into one box. Then we have an ecological crises – water or energy or the climate – that go into another box. So for roughly the past four decades, environmentalists and other radicals have been raising the alarm about these crises but never really figured out how to put them together. Environmental thinkers have been saying one thing and then doing another – they claimed that humans are a part of nature and that everything in the modern world is about our relationship with the biosphere, but then when they got around to organizing or analyzing, it came down to “Society plus Nature,” as if the relationship was not as intimate and direct and immediate as it is. KA: The premise of this book is that we need to break down the “Nature/Society” dualism that has prevailed in so much of Red and Green thought. Where did this idea come from, and why is it so thoroughly artificial? JWM: The idea that humans are outside of nature has a long history. It’s a creation of the modern world. Many civilizations before capitalism had a sense that humans were distinct. But in the 16th, 17th and 18th centuries, this very powerful idea emerged – that is embedded in imperialist violence and dispossession of peasants and a whole series of recompositions of what it meant to be a human, particularly divisions around race and gender—that there was something, in Adam Smith’s words, called “civilized society,” which included some humans. But most humans were still put into this category of “Nature,” which was regarded as something to be controlled and dominated and put to work – and civilized. It sounds very abstract, but the modern world was really based on this idea that some group of humans were called “Society” but most humans go into this other box called “Nature” with a capital N. That’s very powerful. That didn’t come about just because there were scientists, cartographers or colonial rulers who decided it was a good idea, but because of a far-flung process that put together markets and industry, empire and new ways of seeing the world that go along with a broad conception of the Scientific Revolution. This idea of Nature and Society is very deeply rooted in other dualisms of the modern world: the capitalist and the worker, the West and the rest, men and women, white and black, civilization and barbarism. All of these other dualisms really find their taproots in the Nature/Society dualism. The posters that appeared all over Burlington — Vermont’s largest city (pop: 37,000) in the winter of 1980-81 were arresting and provocative. They showed an old map of the city with a label slapped across it that read: “For Sale.” A bold slogan across the top, in turn, proclaimed that “Burlington Is Not for Sale,” and smiling amiably in the right-hand corner was the youngish, fairly well-known face of Bernard Sanders, sans tie, open-collared, almost endearingly shy and unpretentious. The onlooker was enjoined to rescue Burlington by voting for “Bernie” Sanders for mayor. Sanders, the long-time gubernatorial candidate of Vermont’s maverick Liberty Union, was now challenging “Gordie” Paquette, an inert Democratic fixture in City Hall, who had successfully fended off equally inert Republican opponents for nearly a decade. 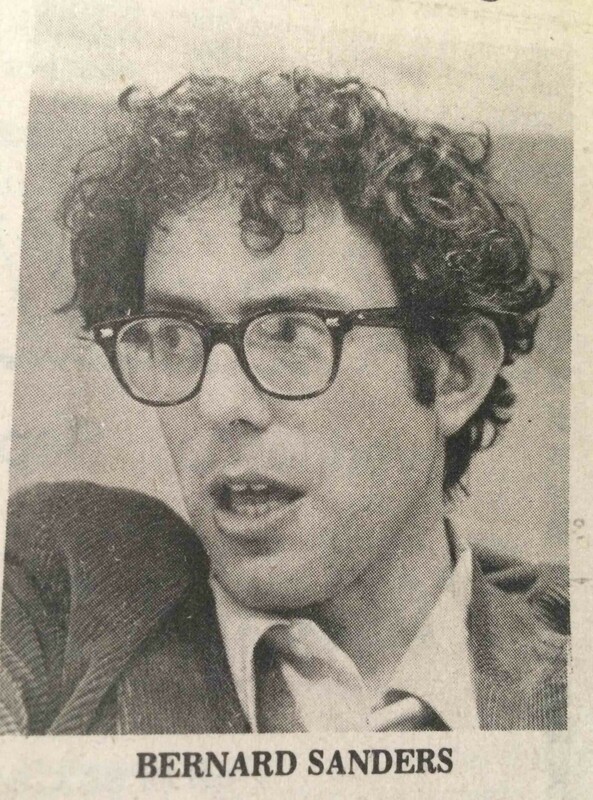 That Sanders won this election on March 3, 1981, by only ten votes is now a Vermont legend that has percolated throughout the country over the past five years. What gives Sanders almost legendary qualities as a mayor and politician is that he proclaims himself to be a socialist — to many admiring acolytes, a Marxist — who is now in the midpoint of a third term after rolling up huge margins in two previous elections. From a ten-vote lead to some fifty-two percent of the electorate, Sanders has ballooned out of Burlington in a flurry of civic tournaments that variously cast him as a working-class hero or a demonic “Bolshevik.” His victories now make the New York Times and his trips outside of Burlington take him to places as far as Managua, where he has visited with Daniel Ortega, and to Monthly Review fundraising banquets, where he rubs shoulders with New York’s radical elite. Sanders has even been invited to the Socialist Scholar’s Conference, an offer he wisely declined. Neither scholarship nor theory is a Sanders forte. If socialist he be, he is of the “bread-and-butter” kind whose preference for “realism” over ideals has earned him notoriety even within his closest co-workers in City Hall.